Contrary to popular opinion, you don’t need to fear your cat while you’re pregnant. Many expectant cat owners mistakenly believe that they cannot keep their cat once the pregnancy is confirmed. This is definitely not true but you will need to take certain precautions for the safety of your unborn baby. Here’s how your cat could potentially affect your pregnancy. How Will My Cat React? Some cats will become stressed and anxious during your pregnancy and even more so when the new baby arrives. It is likely that you will see a definite change in your cat’s mood and behaviour, especially with regards to the baby encroaching on “their” territory. They may react differently to you too during your pregnancy. Many cats are reluctant to sit on your lap, for example, especially as your bump grows. Will My Cat Get On With My Baby? Concerned that your cat will take against your baby? You can reduce this possibility by understanding how best to go about introducing your pet to a new baby. If the introduction goes well, there is every chance that they will get on well. However, if things do not get off to a very good start, this can have repercussions in terms of them getting on well. Treating an area with Zylkene or a Feliway is one way to minimise the stress for the cat during the upheaval. Avoid cleaning your cat’s litter tray during your pregnancy. Cat faeces can carry a parasite called toxoplasma, which has the potential to cause birth defects. In early pregnancy, it can also lead to miscarriage. Many cat owners have already been exposed to toxoplasmosis via their pets. If this is the case, you should not contract it again. If there is no other alternative but to clean it out yourself, always use protective gloves and wash your hands thoroughly afterwards with soap and water. Many cat owners prefer to make the baby’s room off-limits to their cat. If you plan to do this, take steps to prepare your cat in advance so that he or she is less confused when the baby arrives. It is not particularly common for cats to pass on diseases to babies but worms can be a big exception to this. 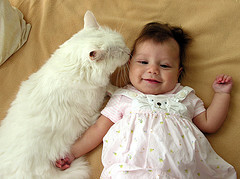 Ensure that your cat has been thoroughly de-wormed before the new baby’s arrival. While fleas won’t necessarily harm your baby, the bites can be extremely unpleasant for him or her so you will also want to make sure that your cat is protected against fleas too.